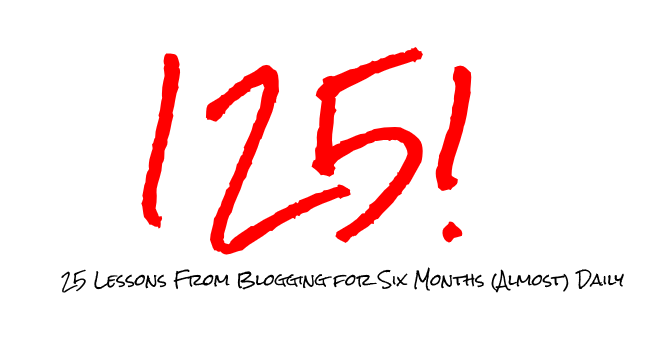 If you have been reading the blog for a while, you know that the plan has been for me to attempt 250 blog posts, posting relatively close to daily. The idea initially was that it would roughly equate to a year's worth of posts, and give a huge backlog of writing material from which to draw to develop additional enhanced material. As this post marks the halfway point of 125 posts, I thought I would do a halfway retrospective list of things I have learned along this journey so far. It is really hard to write every day. I know from listening to years of writing podcasts and reading blog posts that "write every day" is a mantra of various successful writers, but even on my limited Monday through Friday schedule, sometimes things get in the way. Blogs don't automatically generate comments. This isn't Field of Dreams where "If you build it they will come." I honestly don't have a ton of comments on the blog at all. There's certainly a PR element to that, but from a feedback perspective, I have found it doesn't matter. The number of emails, tweets, and Facebook comments I have received lets me know people are reading. Still, I likely have lost several people's interest with a bad post or three. That's OK. It's all for learning. This isn't really the halfway point. I say that for two reasons. First, let's be honest. This is the 125th published post here, but a few of those are obligatory holiday posts, and there are several what I would consider non-post-posts as well. That said, the bigger picture is that 250 is not the actual finish line. It's just a mark at which I will likely reevaluate the daily posting schedule and switch to something more reasonable, perhaps once or twice a week. Twitter is fun. I have managed to grow my Twitter following in this short period by about six hundred percent or more. Turns out Twitter has quite a large market for entrepreneurial discussion, and I've found at least 1300 of those individuals out there. Still, even that has not come easy. I've had to learn a few things along the way. Automation is your friend. I still honestly need even more automation set up, but having my blog posts auto-populate to Twitter and having the ability to utilize Buffer to schedule additional updates has been great when I've been able to maximize its utilization. While I generally do reply genuinely, I'll admit many of my tweets are scheduled. But that's OK, because I still typed it and I'm just trying to space out my content to hit all different time zones. You are never ahead. Sometimes (like this week, in fact), I will write several posts ahead and schedule them out. It makes me feel great. It makes me feel like I'm ahead of schedule. And then I get lazy and take three days off. At which point I am back to scrambling for daily content once again. If only I could be twenty days ahead, I could postpone the scramble for four weeks. Talking to people is valuable. This is a hard one for a writer, but the honest truth is that I have received more subscribers from actually, physically talking to people than I have from posting random thoughts on the internet in a vacuum. I am overambitious. I know this one already. It's even baked into the productivity challenge concepts. That said, when I started this journey, I had intentions of working to write a book alongside this blog experiment. In reality, I spend a good chunk of my writing energy on the blog and leave little for writing outside of that. I have read through some of Nina Amir's information on blogging a book and I have done some additional planning and writing as well, but I think honestly to get a book done I will have to take a less aggressive schedule with the blog. Brainstorming makes writing easier. When I sit down and come up with topics for the entire week ahead of time in a brainstorming session, I have a much easier time writing that week. When I am flying by the seat of my pants every single night, I waste time that I could be writing trying to come up with a new idea. Repetition is not the enemy. At first, I thought I needed a new topic every day. But in reality, every post I write has been a different viewpoint and a different take on a topic, allowing me to retwist the same topics into different deep dives. It also creates categories and threads that will eventually let me build a suite. I had bad writing habits. This one showed up in obvious fashion after sixty or seventy posts. I started noticing verb usage, patterns in my writing, and other habits that I eventually started breaking. The best part of this discovery was that my writing could take a shift during the drafting and required less editing. I will make mistakes. I had a few posts go out with typos. I have had a few that were not the edited version I intended. And I had one that contained a whole pile of gibberish before I was able to clean it up. Mistakes happen. But I was able to clean most of them up as quickly as I noticed them. I make more mistakes when I am tired. I used to write late into the evening, but would find myself on the verge of dozing off sometimes. When that happened, mistakes multiplied. Now I write early in the evening, get it done, and move on to relax for the remainder. Seems to be working much better. Especially when I am a few days ahead. My friends are pretty supportive. I've had several friends reading the posts and emailing, tweeting, or commenting on Facebook about the content. I appreciate all of them. Posting daily also hurts my ability to work on the site. I have some cool additional ideas for the site (including some exclusive content, better sign-up forms, etc. ), but posting daily takes up most of the time that I have available to work on those types of things. Maybe in free time. I need breaks. Maybe scheduled breaks. Sure, I've taken breaks for vacations. That's to be expected. I'm not working at the office, and I'm not working on the blog at home. But with the blog, I have also taken a few extra days off. Sometimes it is lack of ideas, sometimes it is work or personal commitments taking some of the free time that I normally use to blog, and sometimes it is just fatigue. There were several posts about needing recharges, but in reality, I often needed to just take those days and schedule them. I might even need to take a day off of daily posting to work on the site or write double posts to get two to three days ahead. Taking a break to work more, there's a concept. Everyone is willing to sell you an ad. Twitter, Facebook, Google, etc. all have advertising space for sale. And they're very willing to sell it to me. I just haven't bought any yet. It's hard to justify spending advertising dollars when there's no product here on the site to monetize yet. I have more favorites than I will be able to read. I flag articles, emails, and videos all of the time with great ideas on how to improve the blog, great ideas that tie in with topics I write about, and help growing and getting subscribers. At this point, the influx of ideas overwhelms my available time to process and read them all, and I will likely remain backlogged for some time until I decide to purge out that backlog. Blog titles can be magic. I have definitely noted a difference in readership for posts based on the title, but it has not been as predictable as I would have thought. At some point during the posting, I tried out a few more "click bait" type headlines, and I definitely use some of those naming techniques, but I also notice that certain key words have also triggered high response rates. All posts don't generate the same response types. Posts with high numbers of favorites on Twitter don't necessarily translate to posts with high readership on the site and vice versa. Different titles and content trigger different behaviors in people. People like when you make it easy to share things. Keep an eye out - I have an experiment to try to post some code tomorrow that will let you generate Twitter links. But those prepopulated links make it much easier for people to share, and they have. There are all kinds of secret HTML tags you need to optimize a blog. I will likely give the site another HTML makeover at some point and make it much more HTML5 friendly, but I have learned a ton on how to show my name as an author on Facebook shares, how to have unique descriptions and titles on pages, and what value that adds to my SEO and social sharing. Sometimes short posts are good. As I have written more and more, my posts have started getting longer and longer. This one is a good example. That said, sometimes people seem to prefer a quick hitter: a short post with maybe a paragraph or two. This one might be something good to remember in the next 125 posts. At some point, I'll be switching email systems. Right now, if you subscribe, you get a nice Feedburner update every morning in your inbox with a copy of the day's post. It does limit me, though, if I just want to send exclusive content to my subscribers. Right now, I could just email most of them directly in a few chunks, but it would be nice to have it all integrated in a better system. There are a few out there (looking at you MailChimp or aWeber), but might require some investment. Again, when I'm not selling anything or making money off the blog, investing doesn't seem too wise yet. I love writing. But I like other things, too. I didn't learn this through the first 125 posts. I already knew it. In fact, it's likely why I started this little experiment in the first place. I enjoy writing and research and sharing opinions. Often, I write about topics that I really would like to learn more about and through the research process I am able to learn myself before sharing (that's an insider tip, I guess). I have learned a ton about many topics throughout this adventure, but I've also learned about other things I like to do. I like engaging in discussion and dialogue with people about business. I like learning about how other people are succeeding in their business. I like coaching and working to help people that are insecure about their own abilities to achieve more. And I love learning how I might could build something out of this that's bigger than just me and a computer, writing thoughts down for everyone to read. I've learned quite a bit more than 25 things in this half of the experiment, but this post is definitely long enough. Perhaps some of the other lessons will be expanded into posts of their own in the next six months. And I am certain I will learn quite a bit more along the way. No call to action today, no "please tweet this or email me" or anything like that. Just a thank you for reading so far and sticking with me on this. I appreciate it. If there's anything you need or anything you'd like my help with, let me know and I will see what I can do. After all, the blog only has value if it helps you with your business and your problems. Thanks.